This article is about the 1979 treasure hunt book. For other uses, see Masquerade. 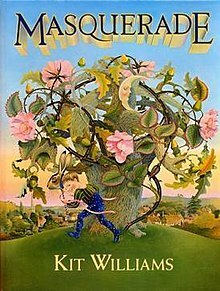 Masquerade is a picture book, written and illustrated by Kit Williams, published in August 1979, that sparked a treasure hunt by concealing clues to the location of a jewelled golden hare, created and hidden somewhere in Britain by Williams. The book became the inspiration for a genre of books known today as armchair treasure hunts. In March 1982 Williams received a sketch which he considered a good enough solution to the puzzle. The golden hare was 'found' by a "Ken Thomas" (a pseudonym of Dugald Thompson) who knew John Guard whose then girlfriend, Veronica Robertson, had once lived with Williams. It later transpired that they had not fully solved the puzzle but used her knowledge that the hare was buried somewhere in Ampthill which led to a minor scandal. Two British physics teachers were later acknowledged to have correctly solved the puzzle. Challenged by Tom Maschler, of the British publishing firm Jonathan Cape, to "do something no one has ever done before" with a picture book, Williams set out in the 1970s to create a book of paintings that readers would study carefully rather than flip through and discard. The book's objective, the hunt for a valuable treasure, became his means to this end. Masquerade features fifteen detailed paintings illustrating the story of a hare named Jack Hare, who seeks to carry a treasure from the Moon (depicted as a woman) to her love object, the Sun (a man). On reaching the Sun, Jack finds that he has lost the treasure, and the reader is left to discover its location. Along with creating the book, Williams crafted a hare from 18-carat (75%) gold and jewels, in the form of a large filigree pendant on a segmented chain. He sealed the hare inside a ceramic, hare-shaped casket (both to protect the prize from the soil, and to foil attempts to locate the treasure with a metal detector). The casket was inscribed with the legend "I am the keeper of the jewel of Masquerade, which lies waiting safe inside me for you or eternity". If I was to spend two years on the 16 paintings for Masquerade I wanted them to mean something. I recalled how, as a child, I had come across "treasure hunts" in which the puzzles were not exciting nor the treasure worth finding. So I decided to make a real treasure, of gold, bury it in the ground and paint real puzzles to lead people to it. The key was to be Catherine of Aragon's Cross at Ampthill, near Bedford, casting a shadow like the pointer of a sundial. On 7 August 1979, Williams and celebrity witness Bamber Gascoigne secretly buried the hare's casket at Ampthill Park. Williams announced publicly that his forthcoming book contained all clues necessary to decode the treasure's precise location in Britain to "within a few inches." At the time, the only additional clue he provided was that the hare was buried on public property that could be easily accessed. To ensure that readers from further afield had an equal chance of winning, Williams also announced that he would confirm the first precisely correct answer sent to him by post. A modified version of the book also appeared in Italian, with a treasure buried in Italy. It was reinvented and translated by Joan Arnold and Lilli Denon with the name Il tesoro di Masquerade (Emme Edizioni). The book sold hundreds of thousands of copies worldwide, many in the United Kingdom, but also in Australia, South Africa, West Germany, Japan (where the book was called 仮面舞踏会 kamenbutoukai), France and the United States. Searchers often dug up public and private property acting on hunches. One location in England named "Haresfield Beacon" was a popular site for searchers, and Williams paid the cost of a sign notifying searchers that the hare was not hidden on the premises. Real-life locations reproduced in the paintings were searched by treasure hunters, including Sudbury Hall in Derbyshire and Tewkesbury, Gloucestershire. In March 1982, Kit Williams received a sketch which he recognised as the first correct solution mailed to him. Williams immediately phoned the sender, "Ken Thomas", a pseudonym of Dugald Thompson, and instructed him to dig for the hare. He realized that Thompson had not solved the puzzle in the intended manner, but appeared at the time to have blundered into a lucky guess. Shortly after Thompson was formally awarded the prize, Williams received a correct solution sent by two physics teachers, Mike Barker of William Hulme's Grammar School and John Rousseau of Rossall School. Barker and Rousseau had seemingly unearthed the prize themselves when digging at Ampthill, but had not noticed it inside its clay box; Thompson discovered it in the dirt piles they left behind. Tens of thousands of letters from Masqueraders have convinced me that the human mind has an equal capacity for pattern-matching and self-deception. While some addicts were busy cooking the riddle, others were more single-mindedly continuing their own pursuit of the hare quite regardless of the news that it had been found. Their own theories had come to seem so convincing that no exterior evidence could refute them. These most determined of Masqueraders may grudgingly have accepted that a hare of some sort was dug up at Ampthill, but they believed there would be another hare, or a better solution, awaiting them at their favourite spot. Kit would expect them to continue undismayed by the much publicised diversion at Ampthill and would be looking forward to the day when he would greet them as the real discoverers of the real puzzle of Masquerade. Optimistic expeditions were still setting out, with shovels and maps, throughout the summer of 1982. "Isaac Newton" painting. Newton's eyes and digits, and those of the mouse in his sleeve, point to letters of the word "H-O-U-R". Newton's rings and puppets also give the sequence for digits and animals throughout the book. The acrostic of these words and phrases reads "CLOSEBYAMPTHILL". Properly interpreted, the message tells the reader that the treasure is buried near the cross-shaped monument to Catherine of Aragon in Ampthill Park, at the precise spot touched by the tip of the monument's shadow at noon on the day of either the vernal or autumnal equinox. Many additional hints and "confirmers" are scattered throughout the book. For example, in the painting depicting the Sun and the Moon dancing around the Earth, the hands of the two figures are clasped together, pointing at the date of the spring equinox. On December 21, 1980 the Sunday Times published an additional clue created by Kit Williams to the puzzle. This drawing needed to be cut out, folded in half and then with a light shone through a message could be read in a mirror. The message read "To do my work, I appointed four men from twenty, the tallest and the fattest, and the righteous follow the sinister." The "...four men from twenty" refers to four fingers and toes out of twenty digits; "...the tallest and the fattest" relates to using the longest digits; "..the righteous follow the sinister" provides a clue to the decoding of the letter order (left (sinister) eyes through left finger and toe first, then the righteous (right) ones). The clue featured a self portrait of Kit Williams surrounded by fourteen animals, the first letter of each making "Merry Christmas". On 11 December 1988, The Sunday Times printed a story accusing the winner of the Masquerade contest of being a fraud. "Ken Thomas" was revealed as a pseudonym of Dugald Thompson, and Thompson's business partner, John Guard, was the boyfriend of Veronica Robertson, a former live-in girlfriend of Kit Williams. Guard had allegedly convinced Robertson to help him because both were said to be animal rights activists and Guard promised to donate any profits to the animal rights cause. The Sunday Times alleged that while living with Williams, Robertson had learned the approximate physical location of the hare, while remaining ignorant of the proper solution to the book's master riddle. After supposedly finding out from Robertson that the hare was in Ampthill, Guard and two assistants were said to have started searching for it using metal detectors. After searching for some time with no success, they drew a crude sketch of the location, which Thompson then submitted to Williams as "Thomas", and it was this that Williams acknowledged as the first correct answer. This tarnishes Masquerade and I'm shocked by what has emerged. I feel a deep sense of responsibility to all those many people who were genuinely looking for it. Although I didn't know it, it was a skeleton in my cupboard and I'm relieved it has come out. Thompson founded a software company called "Haresoft", and offered the jewel as a prize to a new contest which took the form of a computer game, Hareraiser. The company and its game (which many believe to be unsolvable with only meaningless text and graphics), were unsuccessful, yielding no winner. When the company went into liquidation in 1988, the hare was sold at Sotheby's London on behalf of the liquidators, Peat Marwick. The hare was auctioned at Sotheby's in December 1988, selling for £31,900 to an anonymous buyer. Williams himself went there to bid, but dropped out at £6,000. The treasure's whereabouts remained unknown for over 20 years, until it came to light in 2009. The BBC Radio 4 programme The Grand Masquerade, broadcast 14 July 2009, told the story of the creation and solution of the puzzle. Williams was interviewed and presenter John O'Farrell claimed that this was the first time Williams had talked about the scandal for 20 years. During the interview Williams expressed the desire to see the hare again. Hearing this, the granddaughter of its then current owner—an anonymous purchaser "based in the Far East"—arranged for Williams to be reunited briefly with his work. This was featured in a television documentary, The Man Behind the Masquerade, which aired on BBC Four on 2 December 2009. The hare was on display at the V&A Museum, London, as part of its "British Design 1948–2012" retrospective in 2012. Masquerade became the forerunner of an entire genre of cryptic puzzles known as armchair treasure hunts. 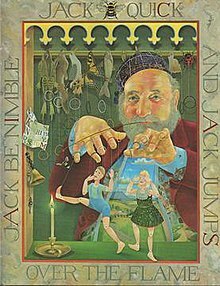 It spawned a succession of books and games from other publishers seeking to emulate its success, including The Key To The Kingdom (Pavilion Books, 1982), The Piper Of Dreams (Hodder & Stoughton, 1982), The Secret (Bantam Books, 1982), The Golden Key (William Maclellan, 1982), Treasure: In Search of the Golden Horse (Intravision, 1984), The Merlin Mystery (Warner Books, 1998) and the French On the Trail of the Golden Owl (Manya, 1993), which is still unsolved. Forrest Fenn took this idea to the Rocky Mountains and dared to conquer the "armchair" genre with his treasure hunt The Thrill of the Chase: a Memoir (One Horse Land & Cattle Co., 2010). Kit Williams himself also created a second treasure-hunt book, The Bee on the Comb (1984). Similar hunts have continued being published in various formats. Many later hunts make use of technologies that were unavailable when Masquerade was published, such as the web-based homage Menagerie, the CD-ROM based Treasure Quest, and Text4Treasure, which uses SMS messaging. Others, such as Army Of Zero and West By Sea: A Treasure Hunt that Spans the Globe (Expeditionaire, 2016) follow Masquerade's use of physical media for the main puzzles, but provide additional clues online. ^ a b c d e f g h i Mark Shields (6 April 2019). "Masquerade: How a real-life treasure hunt obsessed a nation". BBC. Retrieved 10 April 2019. ^ Matt Warman (13 April 2011). "Masquerade: a treasure hunt that ended in a scandal". Daily Telegraph. Retrieved 10 April 2019. ^ Davies, Ross (31 July 1981). "Reckless hunt the necklace". The Times. London. p. 19. ^ a b Gascoigne, Bamber (1983). "Chapter 10". Quest for the Golden Hare. Jonathan Cape. ISBN 0-224-021168. ^ "Masquerade Scam". TheFoolsErrand.com. 11 December 1988. Retrieved 22 March 2016. ^ 52°02′04″N 0°30′27″W﻿ / ﻿52.034546°N 0.507536°W﻿ / 52.034546; -0.507536 Coordinates of buried hare. ^ Barker, Mike (1983). "Appendix: The Perfect Solution". In Gascoigne, Bamber. Quest for the Golden Hare. Jonathan Cape. pp. 205–224. ISBN 0-224-021168. ^ Checkland, Sarah Jane (6 December 1988). "Masquerade Hare fetches £31,900". The Times. London. p. 5. ^ "BBC Radio 4 - The Grand Masquerade". Bbc.co.uk. 24 October 2009. Retrieved 22 November 2012. ^ Hoyle, Ben (21 August 2009). "Final chapter in tale of the golden hare and its creator—who would rather be a tortoise". The Times. London. p. 4. ^ Douglas, Torin (20 August 2009). "Entertainment | Arts & Culture | Artist reunited with golden hare". BBC_News. Retrieved 22 November 2012. ^ John Plunkett (20 August 2009). "Unearthed again – golden hare that obsessed a nation". The Guardian. Retrieved 10 April 2019. ^ Michael, Apphia. "'British Design 1948-2012: Innovation in the Modern Age' at the V&A, London". Wallpaper.com. Retrieved 4 April 2012. ^ Fehr-Snyder, Kerry (10 April 1996). Johnson, Pam, ed. "Scottsdale software chief bets a million on game". The Arizona Republic. 106 (332) (Final ed.). Phoenix, Arizona. pp. E1–E2. ISSN 0892-8711 – via Newspapers.com.